I recently posted this question: Has this function been described/discussed? It received two downvotes, and no explanation on why it isn't a good question. It received one answer, which got one upvote (by me, because even if it didn't actually answer what I was asking, it pointed me to aspects that I didn't realise could be at play) and one downvote. 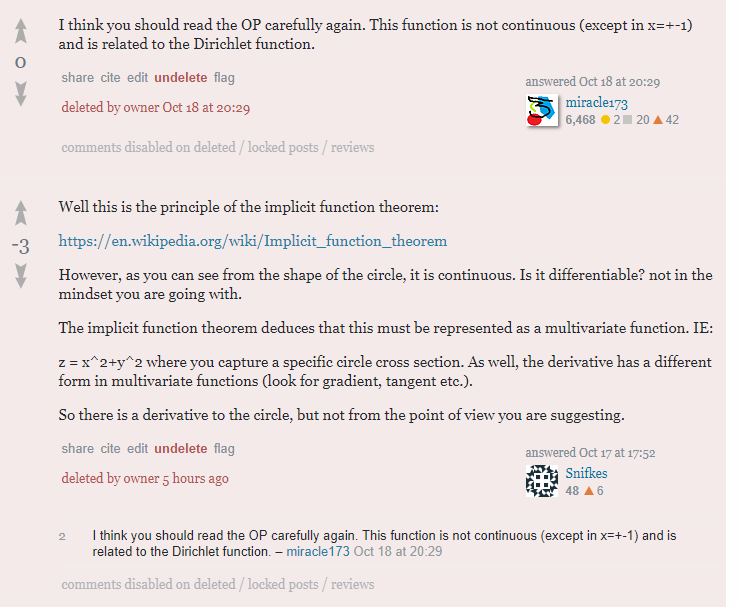 It also got several comments, most of which helpful (one of them actually came close to being an answer, pointing to the similarity between the function in question and Dirichlet's function - so it seems to be not completely unreasonable). So I am asking, what makes the question deserving of downvotes, so that I don't commit the same mistakes in the future? Or is this just a case of newbiephobia in the internet? I have no idea what "it seems each of its points is rather an angle than a point;" means. The mentioned sentence in your post is poorly written. As I understand, the "it" in "each of its points" refers to the function you give in your question. One would say "points of a set", or "points on the graph of a function", but not "points of a function". Moreover, saying a point "is rather an angle" does not make sense. "it is discontinuous at every point, so that each point in the upper hemicircle is immediately followed by a point in the lower hemicircle - an an angle to the straight line between the point and its immediate predecessor." Ok. It seems that you were really talking about "each point on the graph" of your function. But "each point in the upper hemicircle is immediately followed by a point in the lower hemicircle" is conceptually wrong: you are thinking that the rational and irrational numbers alternate on the real line. But NO: in the usual ordering of the reals no element has an immediate predecessor or successor. If you want know more about it, this is certainly not a bad question to ask on the main site. Here's a function that I just made up. Has anyone seen it before? In order for a question of this form to be a good question the construction of the function would need to have some motivation behind it, or there should be something "natural" about the construction. Contrary to that, anyone can just make up any old function, but it would be silly to ask if someone else had named or described that function before. In your specific case, it's when you decide to break the square root into it's positive and negative branch based on whether or not $x$ is rational that you lose me. It seems like a completely unmotivated decision to pick the positive branch for rational $x$ and negative branch for irrational $x$. Why did you choose that? Why not rational vs irrational values of $r$? Why rational vs irrational values at all, and not some other partition of the reals? I hope that this at least in part captures the attitude the downvoters had when they read your question. Not the answer you're looking for? Browse other questions tagged discussion specific-question down-votes . Joke answer to a joke question? Should I significantly edit my own question or should I ask a new one?